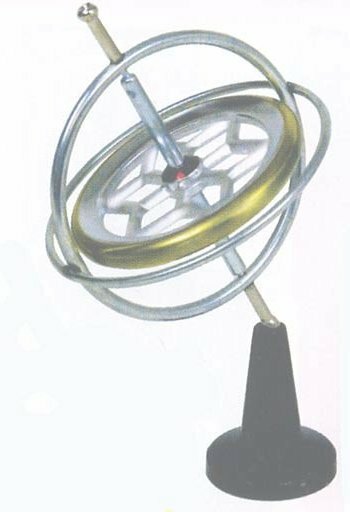 A gyroscope consists of a spinning mass, mounted so its axis of rotation can change. Examples include toys such as spinning tops and powerballs. Gyroscopic effects are also key to things like yo-yo's and frisbees. We are not regularly exposed to the gyroscopic effect and its motion so gyroscopes can seem strange and weird. There are many myths surrounding their motion such as they are anti-gravity devices, but if we let go of a gyroscope whilst holding one it will of course obey the laws of gravity and fall to the floor. In 1974 Eric Laithwaite was invited to give a Royal Institution lecture. 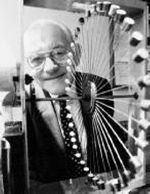 In this he performed a series of demonstrations involving gyroscopes. He claimed that the outcome of these demonstrations showed that Newton's laws of motion are restricted to motion in straight lines where there is no rate of change of acceleration, and that circular motion has some force all of its own. Gyroscopic motion does however follow Newton's laws of motion this is shown through the repetition of Laithwaite's demonstrations and explanation of the subsequent motion using Newtonian Mechanics. Acknowledgement: This page, and all those linked to it, were created by Emma Wilson in 2007 as part of her MEng Thesis at Cambridge University.